Steve Ott (29), who came to the Blues with Ryan Miller in the trade with the Sabres, has noticed the goalie’s decreased workload. TORONTO — Ryan Miller knew this was going to be a huge change and a big chance to win the Stanley Cup. It all looks pretty good so far. The St. Louis Blues are heading home after Tuesday’s 5-3 win over the Toronto Maple Leafs in Air Canada Centre and Miller insists he’s simply trying to fit in to his new team. That’s pretty easy when you’re 8-2-1. And even easier when you have several former teammates, either from Buffalo or the Olympics, in the dressing room. “Just having guys to text or talk to or call if you have a question about anything is good,” Miller said. “Trying to get the rhythm of what everybody does around the rink, it’s different. You come to a new rink and there’s different routines, different meeting times and all these little things that go into a practice day or gameday. I know the Western Conference is a juggernaut but it’s hard to imagine the Blues not at least making the conference final (and thus giving the Sabres their first-round pick). The Blues have 105 points – or more than double that the Sabres have. And Miller isn’t doing much heavy lifting. Miller led the NHL in shots faced last season (31.75 per game) – and the average soared to 35.28 for the hockey-challenged Sabres this year. In his 11 starts for St. Louis, the number is just 23.9. Miller’s stats with the Blues are decent but not eye-popping, with a 2.12 goals-against average and .913 save percentage. He’s learning a new style and coach Ken Hitchcock likened it to when Ed Belfour first joined him in Dallas and slowly melded into a new team. See 1999 to recall how that worked out. “He’s just sorting it out on the ice, getting better every day, but the impact he’s had is in his professionalism,” said Hitchcock. Translated, the Blues want Miller back in his net a little more. That’s how he got burned by Carl Gunnarson for a goal in the third period that cut the St. Louis lead to 4-2. The Blues had a 49-25 advantage in shots – 36-14 over the first 40 minutes – but the game wasn’t sealed until Backes’ hat trick goal into an empty net. It was six minutes before Miller had to face a shot. 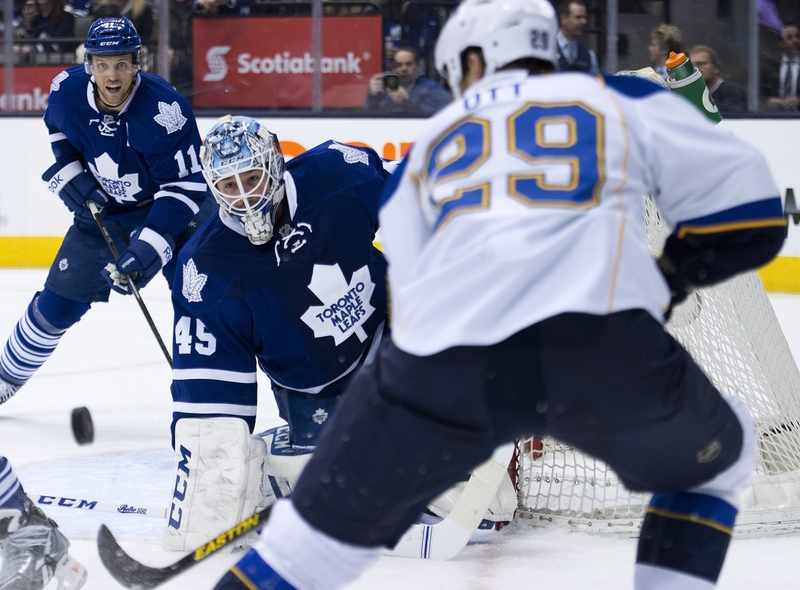 He got beat on shot five from the doorstep by Joffrey Lupul – after making a spectacular diving save on Nazem Kadri. After that, he was pretty much a spectator. The Blues, who play a wickedly hard game on the puck, had 23 shots in the first period alone. Speaking of opportunity, I broke media protocol about keeping questions related to the game and asked Miller about the latest news in Sabreland. And he obliged me. On the departure of Pat LaFontaine, Miller admitted he was shocked like everybody else. “I hadn’t talked to him much. Coming off the Olympics, I assumed they were busy scouting,” Miller said. “I didn’t see him for a while. I kind of noticed it as it was getting closer to the trade deadline that I hadn’t seen Patty. I don’t know what happened. I’ll see Miller again next week, when the Sabres head to St. Louis. By then, he’s hoping he’ll be in more of a routine in his new home. He said he even bets he’ll have a parking pass.